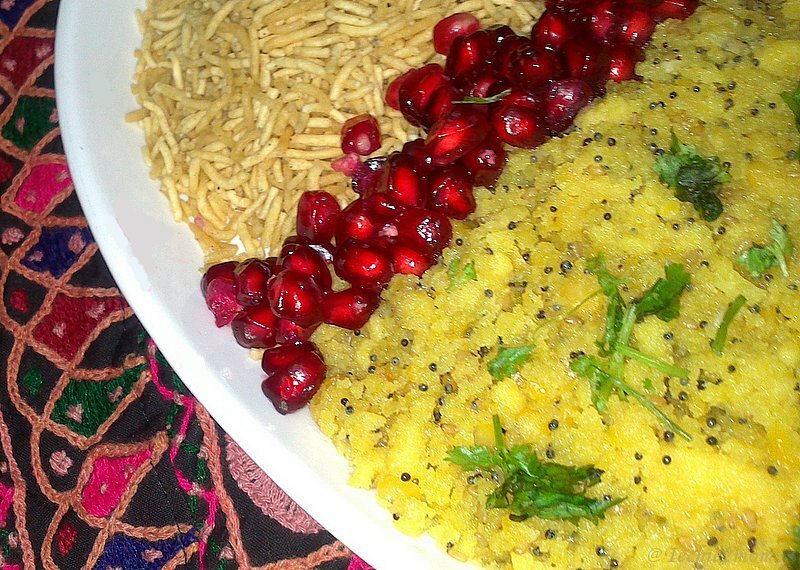 If i like Vaati Daal na khaman then i loooooooooooove Sev Khamani. Of course khamni from daas na khaman is all time favorite….I craved for Khamani in Pregnancy and made mom carry Khamni (apart from other goodies) from Ahmedabad to Hyderabad when she visited us 😉 Yes i love it that much!!!! This is also known as Ameeri Khamani as it is rich in oil!!! 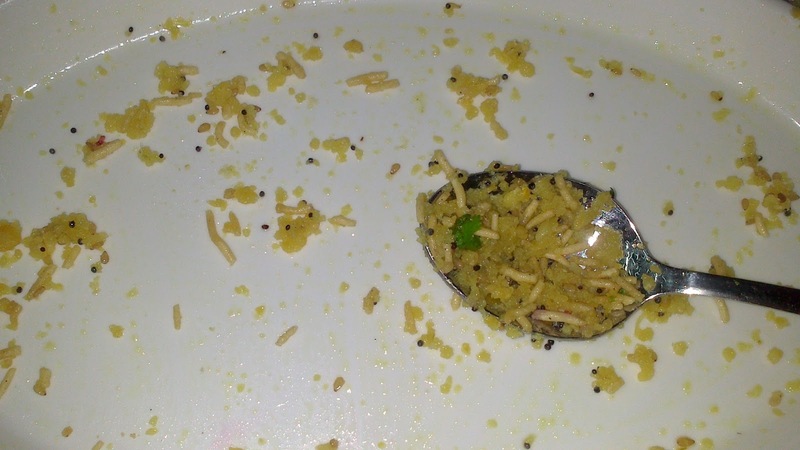 Sev Khamani – It was yummm…..
1) Wash and Soak the chana daal for 3-4 hours and crush to a coarse paste. 2) Add sour curd, mix well. Cover and keep in a warm place for fermentation for around 8 hours. 3) Once fermented add, salt, green chili-ginger paste, soda, turmeric powder and hing. 4) Then steam in a big pateela to get khaman. 5) Once steamed, take out and cool. Then crumble it thoroughly. 6) Now put a pan on medium flame. Add oil. 7) In that add mustard seeds. Once they crackle, add Sesame seeds, hing and garlic. 8) Ensure that the garlic doesn’t turn brown. 10) Cook on medium flame for 5-7 minutes, continuously stirring. 11) Garnish with Pomegranate seeds and dhania patta. And enjoy 🙂 Hey Anamika, this one is for you…. Oh and you see the last few bits of khamni on the spoon?!? I saw it too and planned to eat it after clicking, but it turned out, hubby too had seen it and was faster than me in reaching for the spoon!!!! Not Fair, i know…..
1) On internet i found other way of making khamani. 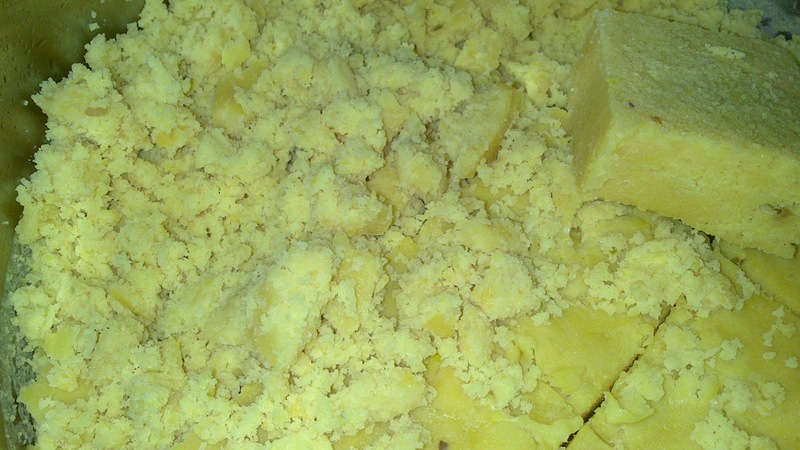 where rather than steaming the batter and making khaman, you can directly give it a tadka. But i didn’t feel much confident about that method. Hence i decided to stick with this method 🙂 If you feel comfortable about it then you can skip steps 4 and 5 and directly give tadka to the khaman batter. But please ensure that it is properly cooked and also doesn’t stick to the bottom of the pan. 3) You can adjust the sugar and garlic as per your liking. 4) Because you are ultimately crumbling the khaman, it’s not needed to add soda while steaming. Sounds very yum T2M. I'm getting to know so many dishes that were previously unknown to me through you 🙂 Love your space! Wow I have never had this but it looks so healthy. Would love making it really soon. Hmmm..If you don't mind the oil then it is healthy 🙂 and definitely tasty!!! Thanks your visit & comments u left in my blog dear…. I absolutely love Ameeri khaman. My Mom used to get a batch for me everytime she visited Dadar (W) in Mumbai, there was a special store we favored for this! I am so bookmarking it! Having your favorite food fro the special shop has its own charm!!! They are kind of memory making material!!! Das khaman house is family friend of ours so we grew up eating this. now i miss this so much here in US. this answer my question u r gujju an amdavadi too. me too.